Venezuelan President Hugo Chávez's assault on the Catholic Church may dissuade voters Sunday from supporting changes that he wants. 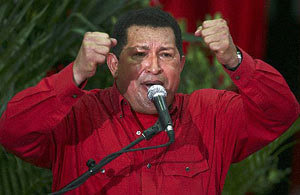 Venezuela's President Hugo Chavez delivers a speech during a rally in Caracas on Tuesday. Venezuelans will decide Dec. 2 whether to approve constitutional changes that would let Chavez run for re-election indefinitely, extend presidential terms from six to seven years, and create new types of property to be managed by cooperatives and communities, among other changes. Venezuelan President Hugo Chávez's habit of verbally attacking his enemies appears to have backfired in his dealings with one of the country's most prestigious institutions -- a Catholic Church critical of the president. Even as he clashed in recent days with King Juan Carlos of Spain and President Alvaro Uribe from neighboring Colombia, the populist Chávez and top government officials were unleashing the worst crisis in church-state relations in decades. Read more at the Miami Herald.